There's fictitious outrage being perpetrated by the mainstream media over White House Press Secretary Sarah Sanders comments during today's Press Briefing, where she stated that President Trump plans to revoke the security clearances of the Obama Administration, many of which General H.R. McMaster approved. The unrealistic opinions of many are that the President of the United States of America surrounding himself with generals in order to protect himself, but as<a href="https://www.circa.com/story/2017/08/03/politics/susan-rice-keeps-top-secret-security-clearance-hr-mcmaster-letter-says?_amp=true&__twitter_impression=true"> Sarah Carter and Circa </a>pointed out at the time, it was H.R. McMaster, former United States National Security Advisor to the President, who approved the continuation of security clearances of many of the Obama Administration’s leading communists. Susan Rice was one of many former government officials to retain a security clearance, which could explain why H.R. McMaster was finally released by President Trump. The General had anticipated the Mueller probe would have ”taken Trump down,” and being in the good graces of one of the culprits who helped destroy the Democratic rule of law in our Constitutional Republic would be rewarding. The truth is, McMaster was making backdoor deals with the enemy, many of whom were later exposed for their treasonous actions and deception, such as now-fired former FBI Deputy Director Andy McCabe, quite possibly the most corrupt man to ever hold that position, second to his boss, the also now-terminated FBI Director James Comey. For those unaware? Susan Rice is the epitome of the term “Globalism,” and after fleeing the White House, without charges against her for her crimes, <i>so far</i>; she's proven this to be a reality by working for George Soros. That's right. George Soros is a leading shareholder in the company Netflix, a story which<a href="https://thegoldwater.com/news/21760-Soros-Leading-Shareholder-Hires-Susan-Rice-to-Netflix-Board"> The Goldwater broke last year</a>, and reaffirmed again when Rice was given a deal with the company. Indeed, Doctor Eowyn, and that company, Soros Fund Management, continued to hold large investments across both the transportation, pharmaceutical, entertainment, energy, retail, financial, aerospace, and many other industries. One of those holdings is in Netflix, whereas July 2018,<a href="https://www.gurufocus.com/StockBuy.php?GuruName=George+Soros&cache=clear&updown=down&order=impact&p=0&n=20"> Soros Fund Management owns 220,000 shares in Netflix</a>, at a price of $362.86 a share, is a whopping $79,829,200 worth of the company. So are you shocked that Rice ended up proving that the Obama Regime was in the pockets of George Soros? You shouldn't be. You were told for years of this occurrence. 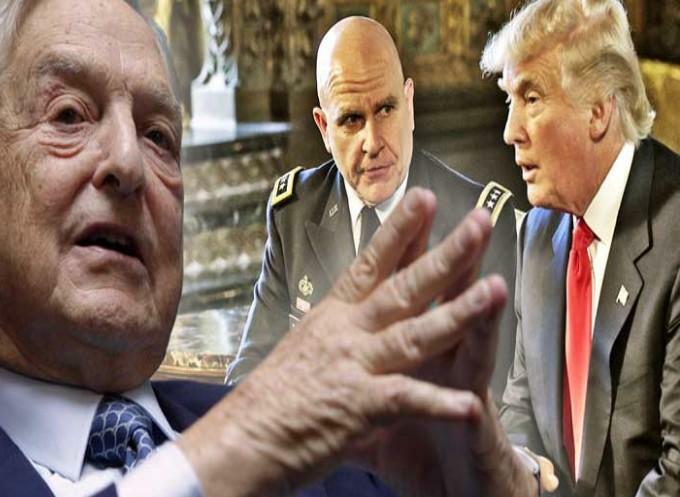 For those unfamiliar with why McMaster would be assisting a Soros puppet like Rice, look no further than a report by Israel National News, which connects the following apertures to lead Soros to the former National Security Advisor to President Trump. <a href="https://www.breitbart.com/jerusalem/2017/08/06/mcmaster-worked-think-tank-backed-soros-funded-group-helped-obama-sell-iran-nuclear-deal/">Breitbart News </a>also told us how H.R. McMaster worked for the same think tank, and that organization? It helped Barack Hussein Obama secure the Iranian Nuclear Deal. For those unaware, Hillary Rodham Clinton used her position at the State Department to manipulate Obama into approving the Uranium One deal, because in doing so, he would please Vladimir Putin, which in turn would equal Putin helping Obama by pressuring Iran into his desired Iranian Nuclear Deal. <a href="https://thegoldwater.com/news/16210-Tick-Tock-The-Complete-History-of-the-Clinton-Crime-Family-and-Uranium-One-from-A-to-Z">”Tick Tock: The Complete History of the Clinton Crime Family and Uranium One from A to Z,” </a>explains these connections. You see how that works, folks? A bit of, “you scratch my back, I'll scratch yours,” and McMaster? His loyalties were to the IISS. Yes, McMaster sold out the “Make America Great Again” agenda of President Trump to continue the process of spying on the Trump Administration from the Obama Regime, by approving security clearances of those loyal to Obama. What was McMaster’s endgame? We're not sure. Is it stock holdings? Cash payments? Blackmail? All of the above? Thank God for our friends in the Mossad, who support President Trump and the nationalist policies of this Administration, who themselves are also battling the internal communism agenda of globalists. Who knows, for certain, what McMaster’s shady dealings and endgame may have been. What we do know, is that President Trump has put the pieces together, cleaned house, and now is planning to revoke the security clearances of those Obama loyalists who have tried to influence and corrupt from within. It doesn't matter what the mainstream media is reporting about this today, what I've just given you are the facts, with solid evidence to support each of the claims above. George Soros is a scourge on humanity, a global Communist, if not terrorist, who commits attacks not with suicide bombings, but with the manipulations of governments all across the globe. Maybe the next time investigative journalists, who spend days, if not weeks, researching the connections of those we claim are infiltrators, has something to say? The people will listen. As it turns out, Roger Stone, Mike Cernovich, Sara Carter, Breitbart, Dr. Eowyn and Investment Watch, Israel National News, and myself at The Goldwater; were all absolutely correct from day one. Now, you know. It's beyond time to arrest George Soros and put an end to his globalist meddling. As for General McMaster, was it worth it? if the Trump revolution fails to drain the swamp a violent revolution will be necessary to save our constitution and way of life. right, the same scum who did 9/11…. George Soros is a Nazi who gave Trump money. Look it up. Just a coincidence that McMasters father just happened to be found dead wth a head injury right after his firing.? Go go go Trump ppl. Boy did Bladmir P fool you. You fell for it hook line and sphincter. Or were you inin it with Vlad the Impaler. Either way, time to Aeroflot back home.